Expanding access to quality real estate investments is one of the main reasons that we started Fundrise. As urban retail developers, we spent our time building unique real estate projects…but more often than not we found that our investment partners were large funds with very little connection to the places we were building. Meanwhile, the people with real understanding of the projects couldn’t invest. Even though they understood the opportunity and our vision, there was no feasible way to allow them to participate. Currently, the vast majority of investments are only available to high net-worth investors, aka accredited investors. Accredited investors make up roughly 3% of the population, meaning that the other 97% of individuals are restricted from these types of investment opportunities. Since 2010, we’ve used Regulation A to allow more than 1,200 unaccredited investors to participate in private real estate offerings—many for the first time ever. However, filing a Regulation A is no small task. Regulation A requires that an offering be both qualified with the SEC, and registered in each state where you plan on offering the securities—this process can take months to accomplish and cost upwards of $50,000. Working within the confines of today’s regulations makes structuring offerings available to unaccredited investors extremely difficult. It’s unlikely to be economically feasible to spend $50,000 and wait six months to raise $500,000 or even $1M in investment capital. As a result, the majority of real estate companies will opt to use Regulation D Rule 506, a more traditional offering type, limited to accredited investors. We continue to wait for the rollout of the Regulation Crowdfunding proposed under the JOBS Act and other opportunities to lower the regulatory burden required to make investment opportunities available to the general public. We still believe that the true power in crowdfunding comes from changing who has the power to invest. Doing so in a way that is economically viable for the project and the sponsors raising capital will be the ultimate game changer. We remain committed to being a leader in this space, not only through words but our actions as well. P.S. Interested in helping further our cause? Write your state representatives and senators and ask them to continue to push for fundraising reform. 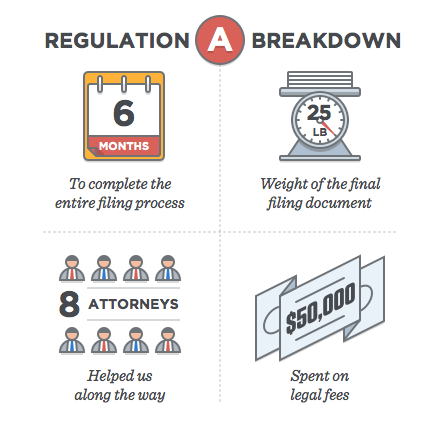 *Fun Fact: In 2011, 19 Regulation A offerings were filed. Only one was eventually qualified by the SEC: a revival of the Broadway musical Godspell.